Did you miss the 2019 live event? GET THE REPLAY! 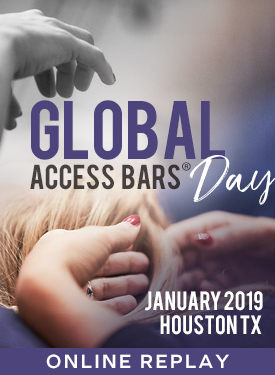 Join the tens of thousands of people around the world that celebrated the 6th Annual Global Access Bars® Day that aired January 6-7, 2019! Enjoy the kick-off with Gary Douglas and Dr. Dain Heer and then continue on with Access Consciousness Certified Facilitators and Access Bars Facilitators around the world. KICKOFF WIHT GARY DOUGLAS AND DR. DAIN HEER! The Access Bars process is designed to create more consciousness for you, your body and the planet. It is made up of 32 points on the head which are lightly touched to create ease in different areas of your life. This dynamic and gentle hands-on body process even assists with things such as insomnia, body aches, depression, stress, addictions, labels and disabilities, and much more. Would you like to learn how to use this phenomenal process? 1-day classes are available worldwide! Join a group of people near you to experience, run and receive Access Bars! It's YOUR choice... YOUR change... YOUR possibility to be a part of the creation of a totally different way of being in the world.